Romanian-born violist Yvonne Creanga enjoys a varied career as a chamber musician, orchestral player and teacher. She has taught violin, viola and chamber music at University of Arizona School of Music, University of California, Irvine and Vanguard University in California as well as at the Interlochen Arts Camp in Michigan. Since 2000 she has been a member of the Tucson Symphony. In addition to her private studio, Yvonne recently founded the Chamber Music Academy for Adults and is a co-founder of the brand new Young Artists in Chamber Music. In addition, she has created the first southern Arizona Viola Plus Institute in conjunction with the ASTA AZ. Yvonne has performed at the Spoleto Festivals, the Settimane Musicale Senese, the Norfolk Chamber Music Festival and with Alexander Schneider’s New York String Orchestra. Her ensembles have won prizes at the Coleman Chamber Music Competition, the Accademia Chigiana, and the Conservatoire Américain de Fontainebleau. An accomplished orchestral musician, Yvonne was a member of Rome’s Santa Cecilia Orchestra and has played with the Cincinnati, Colorado, American, New Jersey symphonies as well as the New York City Opera. 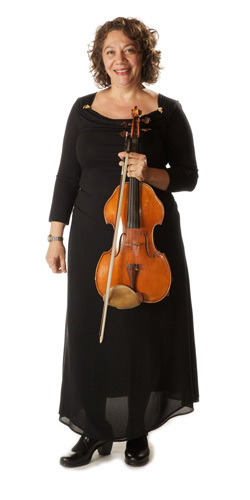 Ms. Creanga studied at both the University of Michigan and the Yale School of Music. She is proud to include Raphael Hillyer, Riccardo Brengola and The Tokyo String Quartet among her teachers. The first and most important event as a very young child performer was my half hour entrance examination for the 1st grade into the George Enescu Music School in Bucharest, Romania in 1967 with the Dancla 1st student Concerto.As an audience member in second grade and the firast time for an evening concert, I remember very clearly my first concert at the National Radio Auditorium. The music was Bedrich Smetana-Ma Vlast: “The Moldau” with a High School orchestra from Sophia, Bulgaria which was, at the time, the equivalent of my music school. I remember saying to myself that is what I will be doing for the rest of my life! It did give me goose bumps to realize that. I started on violin and played for 12 years. I chose to do that when I was a 5 year old ballerina when I heard the next door violin class at the local Cultural Institute in my old town, Bucharest. My mother took my sister and I on the tram twice a week for practices with the ballet group as we belonged to the Romanian Opera little children’s core de ballet. What I enjoy the most is the challenge of chamber music performance but I also love to play Brahms, Mahler and Beethoven symphonies. I love working with my hands so I have a jewelry business and I knit for fun. My early training was in Romania where I did 11 grads in the above special music school and then I won a scholarship to participate in the World Youth Symphony Orchestra at the Interlochen Arts Camp in 1978. After that I went to University of Michigan, Ann Arbor and later on to Yale University. I love Tohono Chul Park and Desert Museum.